1st ODI Sydney: India opener Rohit Sharma smashed 133 off 129 balls in the first ODI at Sydney. 1st ODI Sydney: India opener Rohit Sharma smashed 133 off 129 balls in the first ODI at Sydney. Once he was out, it was almost the last nail in the coffin for India as Rohit was the man who could have got India there. Rohit looked tired in the end as a tired shot brought an end to his innings. But, an incident during the match when Rohit crashed onto his stumps stole the show as Twitterverse had a laugh over it. 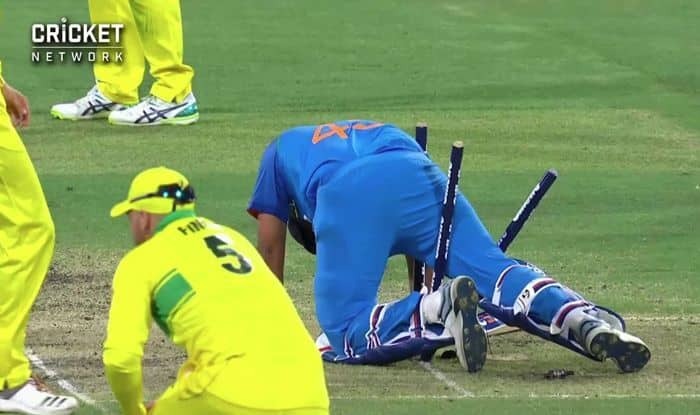 Earlier, it was Rohit Sharma who took a sharp catch at first slip as Carey tried to cut a ball too close to his body only to get an outside edge. Rohit completed his hundred off 110 balls that included, seven fours and four sixes It seems baby girl ‘Samaira’ has brought daddy Rohit luck as he also matches to Sourav Ganguly’s record of smashing 22 ODI centuries. He walked off to a standing ovation as the record-holder of the highest ODI score by an Indian at the SCG. It was the short ball and Rohit went for his go-to shot, the pull. It was a big top-edge and Maxwell does well to run forward and claim a clean catch at deep mid-wicket.